Spring Luncheon and Scholarship Fundraiser - Council of Rockford Gardeners, Inc.
for Kishwaukee College Horticulture students. 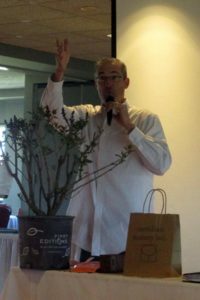 Our speaker in 2018 was Robb Firch from Meridian Nursery who entertained us and got us all laughing after the luncheon and supplied us with many surprise give-away flowers, shrubs, and garden supplies. Thank you, Robb! !